Participation in meaningful activities in the home and in the community contributes to health, wellness, and quality of life for everyone. Occupational therapists fill a unique role in the field of environmental modification by facilitating the creation of a safe and accessible home that allows people to safely do what is important and relevant to them. They do that by following the same clinical reasoning pathway occupational therapists in all settings use—evaluation, intervention, and outcome measurement—completed in a continuous loop to ensure that practitioners are best meeting the needs of clients and those who care for them. 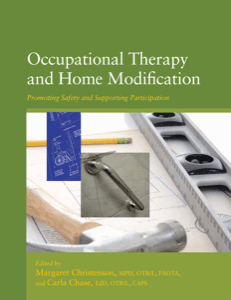 Occupational Therapy and Home Modification: Promoting Safety and Supporting Participation describes the role of the occupational therapist within the multifaceted processes related to home modification. An overview of the entire evaluation–intervention–outcome progression is included along with more detailed descriptions of assessment tools and recommendations for promoting client-centered practice and occupation-based outcomes. It also provides specific suggestions for supporting good communication with various professionals within the field of home modification to best meet the needs of the client and the community. Case examples describe possible solutions to clients’ accessibility and other needs. Note that the ebook does not include the flash drive contents supplied with previous print editions.